Congratulations to "Maureen C.", the winner of Melinda's JRS giveaway. Thank you to all who participated! I love reading books in a series. Once I fall in love with characters, I want to see them again. So after SHE CAN RUN was published in 2011, it felt natural to make that story the beginning of a series. SHE CAN TELL followed in 2012, and now SHE CAN SCREAM releases this week (2013). 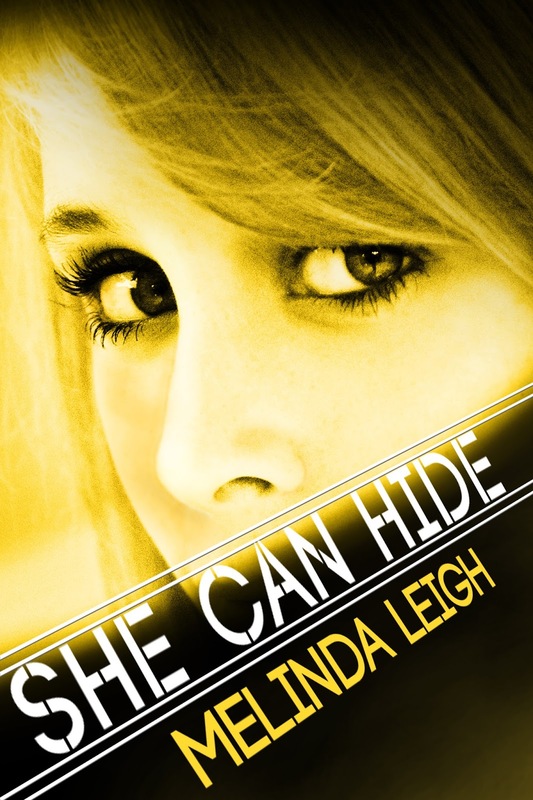 SHE CAN HIDE will be published in March 2014. In the SHE CAN series, the connections between the books are very loose. It isn’t necessary to read them in order to understand the plots, but it is necessary for me to remember everything that happened in all four books. You’d think this would be easy. After all, I wrote them. Four books into the series, I’m forgetting important details. I had a spreadsheet to keep track of physical descriptions, but there just wasn’t enough information. How did Beth’s (SHE CAN RUN) first husband die? I have no idea, but I might need to know for a future book. On several occasion while I was writing SHE CAN SCREAM and SHE CAN HIDE found myself searching through my old books looking for information. Writing stand-alone novels was becoming much more appealing. Enter my personal hero, my husband, who is building an entire database for all the characters in both my series. He’s even entering all the data I had listed on my old spreadsheets. Just the other day, he informed me that between my 4 SHE CAN books and 2 MIDNIGHT novels, I have a total of 114 characters. 114! Egad. No wonder I couldn’t remember everything about all of them. Sorry, my inner geek got over excited. Long story short, with the help of my brilliant husband, I can continue to write my series with all the important information at my fingertips. When I started this crazy journey into published, I never imagined this would be an issue. Frankly, it’s a good problem to have, and I’m grateful to all my readers who love my series as much as I do. How do you feel about books in a series? Do you prefer books with interconnecting plots or, like the SHE CAN series, would you rather have the connection between books loosely based on location and characters? I’ll send a signed copy of SHE CAN RUN, SHE CAN TELL, or SHE CAN SCREAM to one lucky commenter. Also, join the tour giveaway down below! 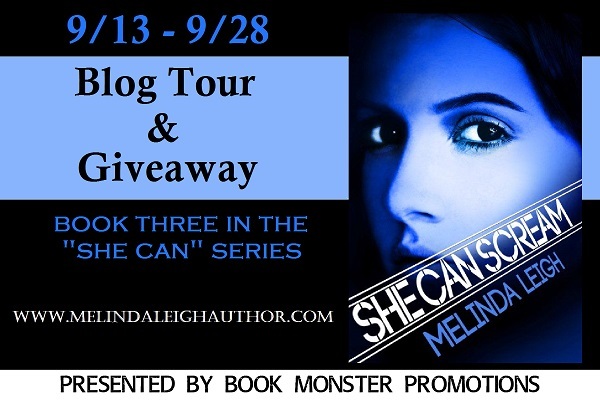 In addition to Melinda's tour giveaway below, she is giving away a signed copy of either SHE CAN RUN, SHE CAN TELL or SHE CAN SCREAM to one commenter at this stop! I like books in a series but I want them to stand on their own too so that I can read them out of order or skip one if I want to. That describes the She Can serves perfectly, Maureen. This sounds like a series that is right up my alley. I read books that are both ways.. Books in a series that are tied together and books in a series that are stand alones. Either way I tend to read them in order cause I'm obsessive. I'm glad to see that readers are enthusiastic about books in a series! This series sounds fantastic. Scary, but good. I do like it when I have a complete series in hand for a back to back read. I actually like them either way! I do like seeing characters from previous books show up in new ones, though. I love series books, both loosely based and connected. I love books in a series as long as the books are stand alone and you don't have to read them all. I love series mainly b/c I"m a glutton for characters that I've become invested in :) Congrats to Melinda on the new release and thanks for sharing!